Buck Buchanan was born in Waco in 1900. His father, Ollie Buchanan, was also a member of Waco 92 and had a farm on which Buck worked growing up. By the time he was a man, Buck knew he wanted to be a man of law. On April 23, 1923, Buchanan joined the Waco Police Department shortly after becoming a mason at Waco 92. His first job was as a motorcycle cop. Just five years later, he was promoted to the Detective Department and soon became department Chief. After a few years spent as Chief Detective for Waco PD, he was recruited by the FBI and in 1934, Buck became one of J. Edgar Hoover’s famous “g-men” focused on capturing gangsters during the 1930s. He quickly gained a reputation within the Bureau for his unusually calm demeanor when being shot at and his top-notch marksmanship. Buchanan was given assignments all over the states usually dealing with high-risk fugitives. On May 1, 1936, Buck received the assignment for which he is most remembered. He arrived in New Orleans as J. Edgar Hoover’s right-hand man for the purpose of detaining Public Enemy Number One, Alvin Karpis. 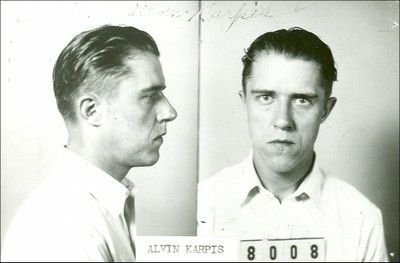 Karpis had threatened to kill Hoover and so the Director wanted to send a message by personally arresting the gangster. Various details of the arrest have been disputed over the years but one thing is very clear: Hoover forgot handcuffs and after realizing this mistake upon apprehending Karpis, the Director used our own Brother Buchanan’s necktie to restrain Karpis’ hands. Buchanan got the tie back later and sent it to Hoover as a gift in 1940 but unfortunately, the necktie is lost to history. The story, however, has gone on to be one of the more famous from the gangster era. You can see the FBI document which listed Brother Buchanan as present at the arrest by clicking here. 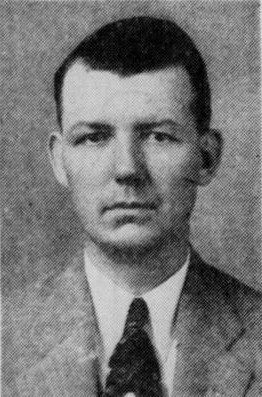 Afterwards, Buchanan was assigned to another relatively famous case, the kidnapping of Charles Mattson, and he spent the remainder of 1936 working on that from the Seattle FBI office. In December of 1941, Buchanan was sent to Hawaii to investigate the attack on Pearl Harbor and make recommendations to the Bureau regarding matters of national security and how to prevent future attacks. In 1942, Al Capone’s long-time rival, Roger Touhy, escaped from prison with his gang and once again, we find Brother Buck Buchanan performing successful work for the FBI in chasing down and detaining the dangerous fugitives. Buchanan developed life-long friendships while working in the Bureau with such men as the legendary Jelly Bryce. 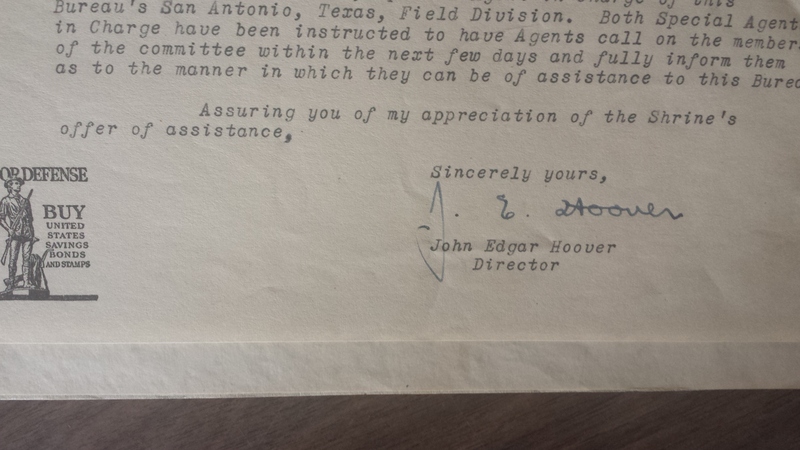 One of his friends, J. Edgar Hoover, sent Waco 92 a letter and we are fortunate enough to still have that in our possession today. Buchanan was an active Mason whenever time allowed and was also a member of our local Scottish Rite and Shrine. He passed away in 1947 and was laid to rest with Masonic honors by Waco Lodge in Oakwood Cemetery. Another Waco 92 member, Tom Street, was also an FBI agent as well as our Past Master.